"Illamasqua believe in the freedom of expression, equality, and diversity. That’s why we are horrified by President Trump’s actions to date. As such, we will never knowingly sell our products to people who support President Trump’s values." Before you buy makeup on the site, they ask you to take a pledge to respect all human rights. The brand wants to spread a message of positivity and inclusion, but can they really stop Trump supporters from buying their brand. The answer is no they can't. "We’re realistic. We know we can’t stop anyone buying our products," they said in an open letter. "But we also know that no matter how hard some people work to make themselves beautiful on the outside, make-up can never hide the ugliness inside. So please, if you don’t agree with the above [Human Fundamentalism values] DON’T BUY US." 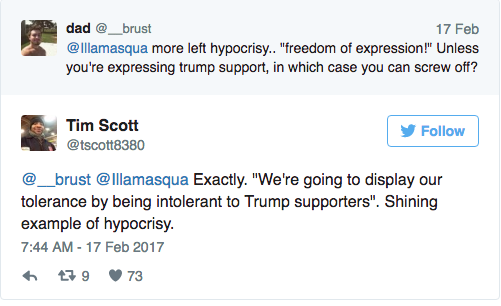 Julian Kynaston, the founder of Illamasqua, said in an interview with Buzzfeed that the company would not ask potential customers if they support the president. The brand's campaign was meet with mixed reactions. Many people applauded Illamasqua for their stand and many people also critiqued them for forcing their political views on customers. Do you agree with Illamasqua? Let us know in the comment section below!